King Henry VII. The Tudor. 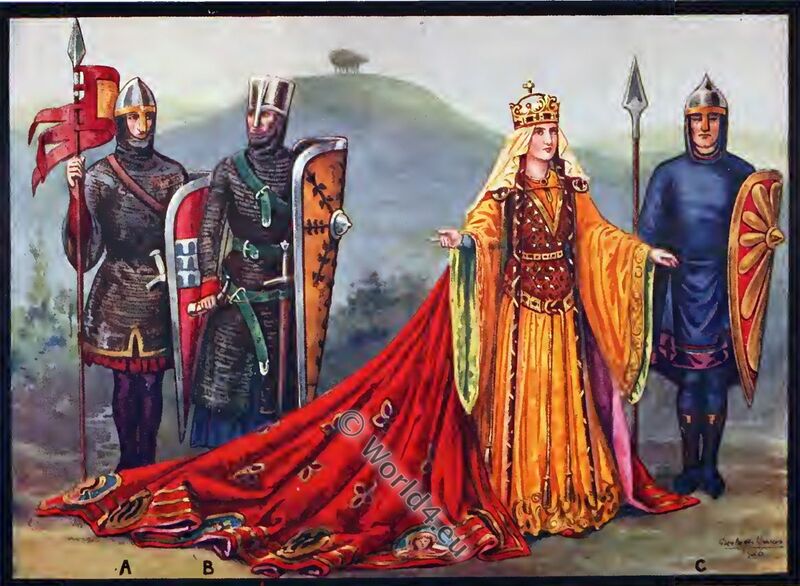 Pictures and Royal Portraits. 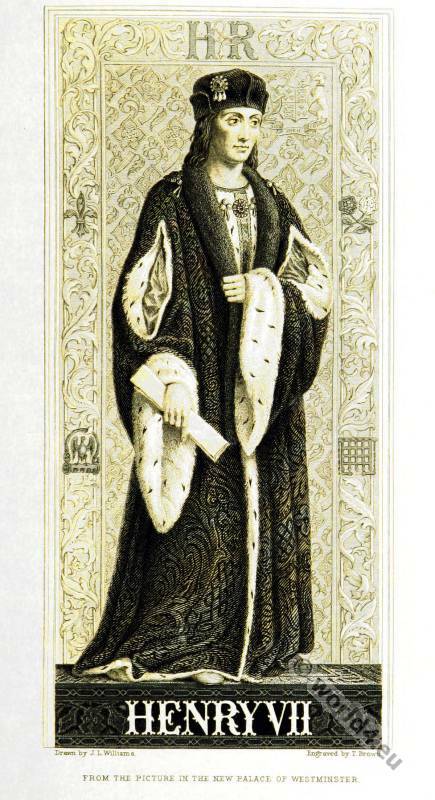 Henry VII.. From the picture in the new Palace of Westminster. 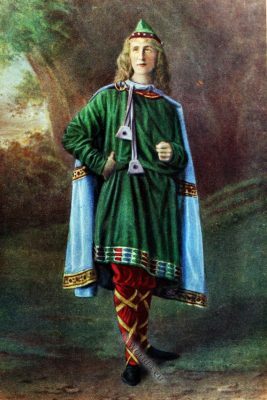 King Henry the VII. The Tudor. 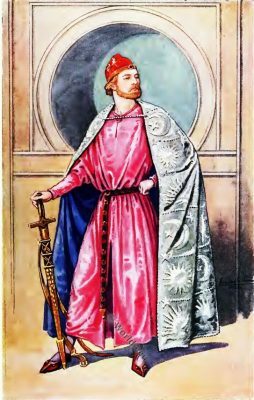 This entry was posted in 1480, 15th Century, England, Fashion History, Nobility, Renaissance, Tudor and tagged English history, Pictures and Royal Portraits, Renaissance fashion era, Tudor period on 4/27/15 by world4. The Second Republic. 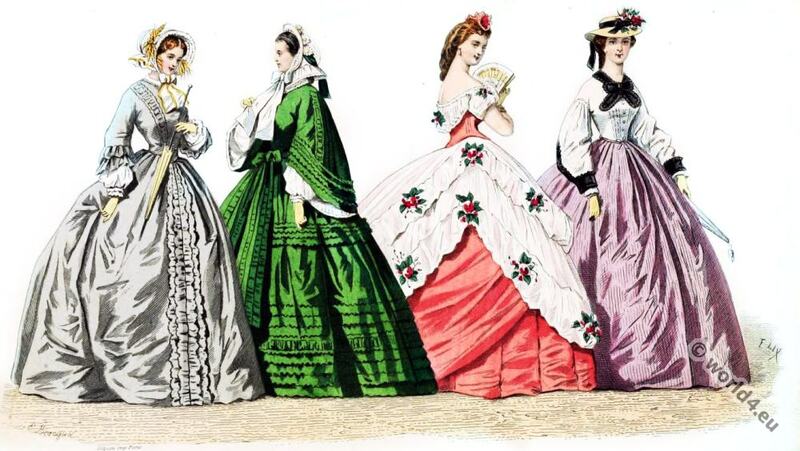 Fashion 1848 to 1851. 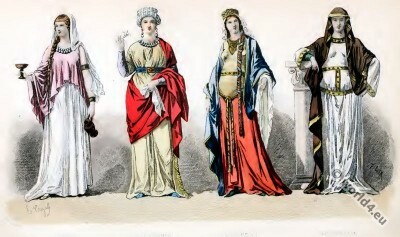 Fashion and Costumes of the The Second Republic. Fashion and Costumes of the The Second Republic. 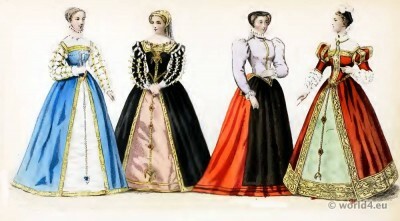 1848 to 1851. Tricoloured stuffs of 1848 — Girondin mantles — Open gowns — Summer dresses — Kasawecks and their derivatives — Beaver bonnets; velvet bonnets, and satin or crape drawn bonnets — Cloches, Cornelia, Moldavian, and Josephine cloaks; mantles — Isly green — Opera cloaks — Numerous styles of dressing the hair: a la Marie Stuart, a la Valois, Leda, Proserpine, and Ceres — Marquise parasols — Jewellery — Straw bonnets — “Orleans” and “armure” — Work reticule or bag — “Chinas” — Pagoda sleeves — Waistcoats; basque bodices — New and economical canezous. 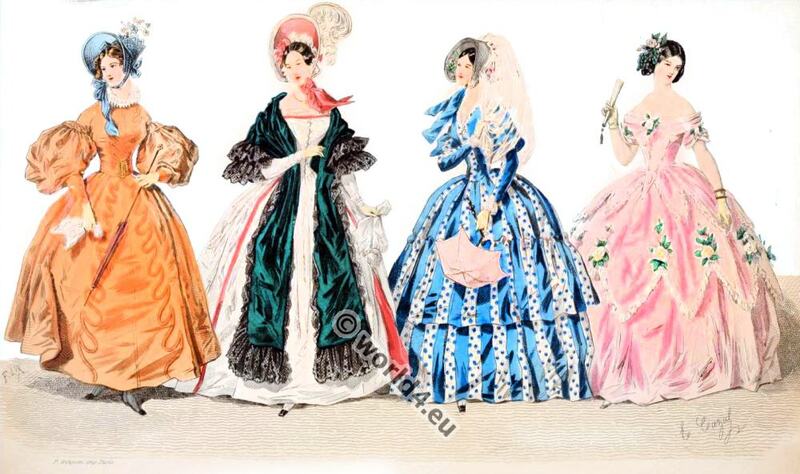 This entry was posted in 1848, 1849, 1850, 19th Century, Fashion History, France, Second Republic, Victorian period and tagged Augustin Challamel, Second Republic Fashion, Victorian fashion on 2/25/15 by world4. Fashion in the Reign of Louis XV. 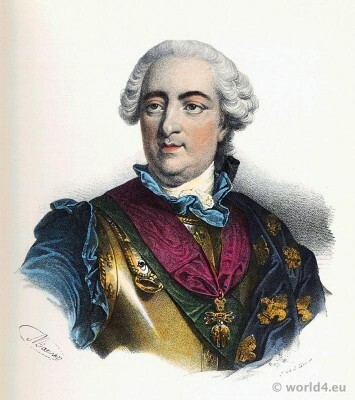 1715 to 1774. The Regency — War is declared against paniers — The Oratorian Duguet — Opinion of the “Journal de Verdun” — Various publications against paniers — Lines by Voltaire — Whale-fishery company — Paragraph from the “Journal de Barbier” — Mmes. Jaucourt, De Seine, Dlisle, Clairon, and Hus — Lines in praise of corsets — New bodices — Coloured prints are forbidden — “Perses” or “Persiennes” — Bagnolette – Adjuncts of dress: necklaces, ridicules, and poupottes—Contents of a patch-box — A sermon by Massillon – Les mouches de Massillon, or Massillon’s patches — Filles de Mode, Fashion-girls — Some passing fashions—Powder remains in fashion — “Monte-au-ciel” — Simply made gowns — The first cachemire. This entry was posted in 1715, 1774, 18th Century, Ancien Régime, Baroque, Fashion History, France, French fashion history, Rococo and tagged Allonge wig, Augustin Challamel, Baroque fashion, Rococo fashion on 2/20/15 by world4. Reigns of Henri IV. and Louis XIII. REIGNS OF HENRI IV. AND LOUIS XIII 15S9 TO 1643. 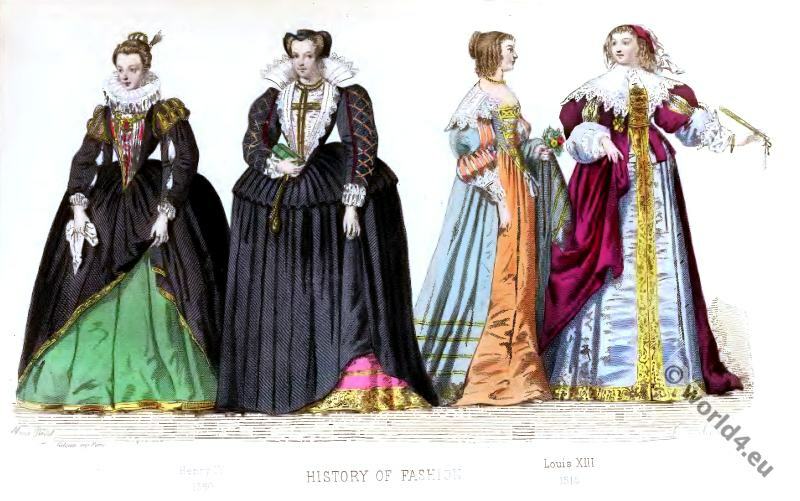 Fashion in the Reigns of Henri IV. and Louis XIII. 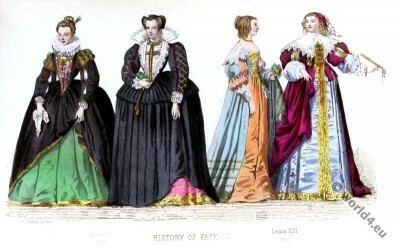 1589 to 1643. 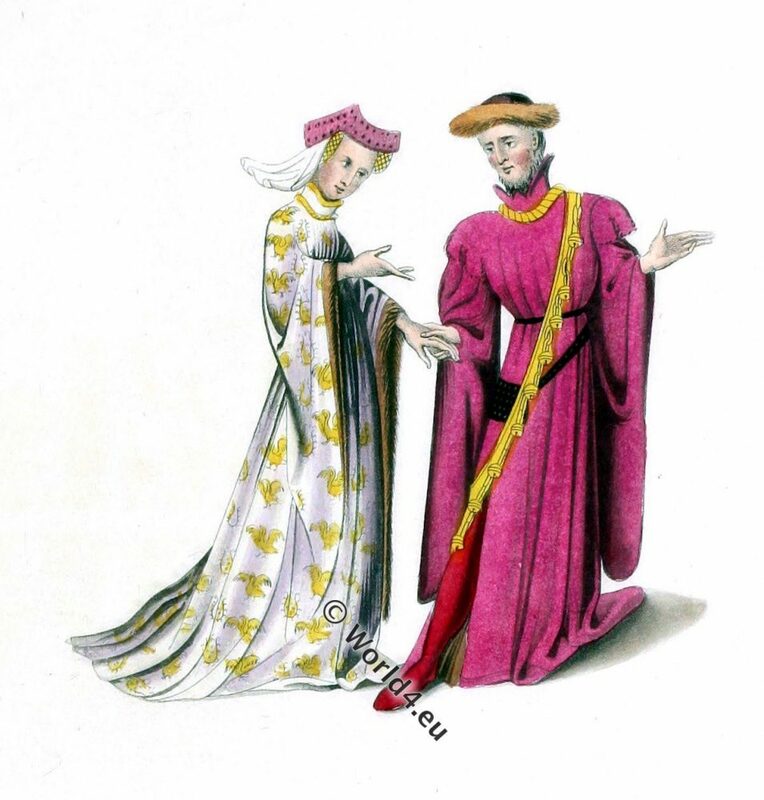 This entry was posted in 1590, 1640, 16th Century, 17th Century, Ancien Régime, Baroque, Fashion History, France, French fashion history, Nobility and tagged Augustin Challamel, Renaissance fashion era on 2/16/15 by world4.